As a dabbler in the art of lyric-writing, I never cease to be amazed by the work of Michael Flanders and Donald Swann. Though a bit newer than most of my RADIOLA! material, this selection is a classic and is guaranteed to delight. Tune in tonight (Friday) at 8 PM Eastern to WHCL (with streaming HERE). The show will be uploaded to Live365 this weekend. This RADIOLA! celebrates (not too strenuously) the arrival of nice weather, and the positive feelings that accompany it. Tune in tonight at 8 PM Eastern to WHCL (with streaming HERE), or listen later to Live365. No sweat. Don't tax yourself. Just enjoy. Nostalgia ain't what it used to be, thank God. This RADIOLA! explores the Hi-Fi and Stereo caricatures of vintage music that (fun though they were) almost killed the real thing--and offers definitive 1920s examples of the tunes, along with sensitive and creative newer recordings that capture the actual tone and spirit of the era. (Also, I'll fill a few recent requests.) Tune in tonight at 8 PM Eastern to WHCL (with streaming HERE). The program will be uploaded to my Live365 station this weekend. 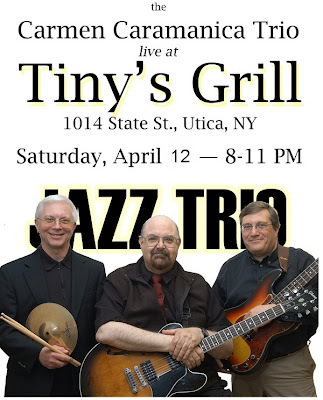 Carmen Caramanica, Cosmo Castellano, and Rick Compton will play one of their all-too-infrequent gigs on April 12 (8-11 PM) at Tiny's Grill (1014 State St., Utica NY). They play music somewhat more modern than that featured on RADIOLA!--but they are remarkable musicians, and this performance is not to be missed by anyone who appreciates excellent jazz. This weekend, The Harlem Blues & Jazz Band billed as "The World's Most Authentic Swing Band" will be appearing locally for two performances. On Saturday, April 12 at 3 PM the group will play at the Utica Public Library, 303 Genesee St., Utica NY (sponsored by the Jazz, Blues & Libraries Too Concert Series). On Sunday, April 13, they will perform at the Filius Events Barn at Hamilton College in Clinton, NY (sponsored by The Jazz Archive, BSU and Dean of Faculty Office). The Hamilton concert begins at 3 PM, with a pre-concert meet-and-greet at 2 PM. The events are free and open to the public. 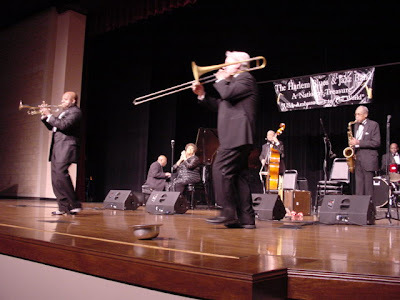 The Harlem Blues & Jazz Band is the world's most authentic swing band. It stars veteran jazz and blues musicians whose roots reach to the classic period of the '20s and '30s. Together since 1973, these “originals” actually “jumped” at the Woodside and “stomped” at the Savoy, with Duke Ellington, Cab Calloway, Count Basie, Lionel Hampton, Fats Waller, Louis, Armstrong, Billie Holiday, and other jazz greats. These are the artists who created a new genre, of music for America. The Harlem Blues & Jazz Band, touring since 1976, has been called “a national treasure,” and has been enthusiastically embraced by audiences around the world. Tonight's RADIOLA! is all about Broadway--and not just the thoroughfare, but the much-loved dime-store label as well. (Thanks to Leah Bezin of the West End Jazz Band) for the suggestion. Tune in at 8 PM Eastern to WHCL-88.7 FM (with streaming here). A special presentation of "Hammond Bacon" featuring Den Otis (sp?) will follow RADIOLA! at 10. "Broadway Rhythm" will be uploaded to my Live 365 station this weekend.